Who from His altar call; Extol the stem of Jesse's rod, And crown Him Lord of all! Ye ransomed of the fall, Hail Him who saves you by His grace, And crown Him Lord of all! The wormwood and the gall, Go spread your trophies at His feet, And crown Him Lord of all! On this terrestrial ball, To Him all majesty ascribe, And crown Him Lord of all! 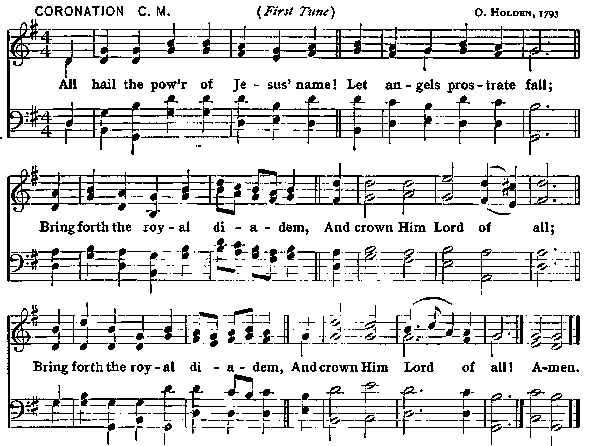 6 Oh, that with yonder sacred throng We at His feet may fall, Join in the everlasting song, And crown Him Lord of all!